Donald Trump never filled the riverfront retail space in his namesake tower, affording him a big tax break. DOWNTOWN — Donald Trump reportedly doesn't pay federal income taxes, and the presidential candidate has a pretty sweet deal in Chicago, too. A state legislator is now cracking down on tax cuts for vacant stores — mainly empty strip malls and other properties that blight Chicago's neighborhoods. Another landlord who gets a tax break? Trump. 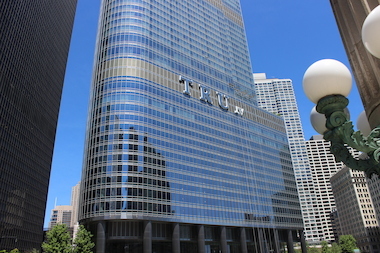 Despite its idyllic setting on the Chicago River, the retail space in the Trump International Hotel & Tower has remained empty since the 92-story high-rise opened in 2009. While sitting on an empty space for seven years would sink most landlords, the nearly decadelong delay has benefited Trump, whose tax bill has been cut by nearly 70 percent on his empty stores at 401 N. Wabash Ave., according to reports. "I find it hard to believe there is not an ability to get retail tenants in that space; you’d think everybody would want to be there," said state Rep. Rob Martwick (D-Jefferson Park), who's pushing the new legislation. "When you talk about Trump Tower being vacant for seven years, that’s probably abuse." Reports earlier this year by WGN and the Sun-Times show Trump was billed $2.4 million by the Cook County Treasurer in 2010 for the empty stores. But after Trump contacted his lawyer, 14th Ward Ald. Ed Burke, his bill was cut nearly 70 percent to about $785,000. Burke — the City Council's longest-serving alderman and chairman of its Finance Committee — successfully argued that Trump endured hardship attempting to fill the retail space, winning him a so-called "vacancy deduction." Such deductions were common during the recession, but now Martwick wants to crack down on landlords he believes are voluntarily keeping their stores vacant for tax breaks. Trump said during last week's presidential debate that not paying taxes makes him "smart." Anthony Campagni of RKF, which is handling leasing for Trump Tower's retail, said there's no update on leasing activity. Representatives for Burke and Trump did not return messages seeking comment.